Sloane Crosley will be reading from her latest book of essays How Did You Get This Number tonight at University Book Store at 7:00 p.m. This event is FREE. We're just going to assume that like us, you too first fell in love with cute-as-a-button Sloane Crosley after reading her first collection of short essays, I Was Told There'd be Cake. Once dubbed as the writer of the worst-selling Maxim cover story in the magazine's history, Crosley has since been compared to many of our all-time literary favorites including Sarah Vowell, David Sedaris, and the infamously always lovely Dorothy Parker. 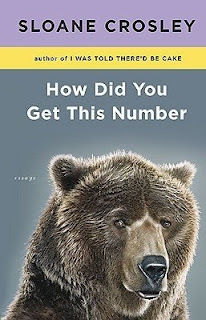 How Did You Get This Number does a fantastic job of further highlighting Crosley's maturity as a writer and now as an early thirtysomething who has moved past the young woes of botched first jobs and the like, and into more of an adult realm of situational humor. However this is not to say that her second collection of essays is any less humorous than the first; rather we think it just may be the opposite. Crosley remarks on the differences between her two collections by saying, "I Was Told There'd be Cake was very much more about generational disappointment. Thus, How Did You Get This Number is a grown-up version of those same ideas. Disappointment 2.0... I Was Told There'd be Cake was really about trying to connect with people and failing. In How Did You Get This Number, the connections are there but they are broader (encompassing places as well as people). They go deeper and then what? Complications ensue and life is just as amusing and odd as ever when the stakes are higher." And with essays based in locations such as Lisbon, Portugal to New York where she lives, to Anchorage, Alaska and more, Crosley reminds us once again in How Did You Get This Number of life's little moments and humorous gems that everyone--regardless of age--can relate to. And as Crosley continues to nail each essay perfectly and poignantly, there we were nodding right along with her and thinking, "That's JUST how we remember it." One of those special moments where you find yourself dog tagging page after page and wishing that the author was rather a close friend and you could call them just to say, "ME TOO!" 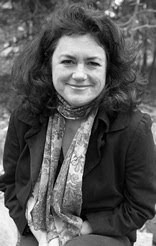 Cammie McGovern will be reading from her latest mystery novel Neighborhood Watch tonight at Elliott Bay Book Company at 7:00 p.m. This event is FREE. In Cammie McGovern's third novel, Neighborhood Watch, we meet Betsy Treading, the "Librarian Murderess," who has been exonerated from prison with the help of DNA evidence after twelve long years. Betsy believed that she had murdered her neighbor Linda Sue during one of her sleepwalking episodes after finding a bloody nightgown in her laundry hamper; though she has no recollection of the night or of committing the murder. After being released from prison, Betsy returns to her old suburban street in search of answers to twelve-year-old secrets and most of all, in search of Linda Sue's true killer. However, Betsy has no idea just exactly how many secrets are truly buried behind the beige walls of the seemingly innocent, white picket fenced homes of Juniper Lane. How did you go about your research for Neighborhood Watch? I started Neighborhood Watch after watching a particularly powerful documentary called After Innocence, about the over-200 convicted criminals who've served many years in prison (some on death row,) and been completely exonerated for their crimes after new testing DNA evidence revealed they weren't at the scene of the crime. In something like half the cases, these defendants were convicted in part because they'd confessed. This is a far more common phenomenon than most people realize and I wanted to look at why and how a person might confess to a crime they haven't committed. Usually the explanation is a complicated one: they might have wanted to commit the crime, or considered it. Or they might be confused by police interrogation tactics and believe admitting some part in a crime will get them off. Or--in the case of Betsy, a chronic sleepwalker--they might have no memory of the incident and believe it could have happened. Most juries operate on the assumption that no one in their right mind would ever confess to a crime they didn't commit and the truth is far murkier, and more psychologically interesting, I think. In our most private moments, we are all guilty of dark impulses which most of us can be reasonably sure we'd never act on. But what if you were a sleepwalker, prone to acting out such impulses without any awareness of doing so? As I worked, I found researching sleep disorders to be particularly compelling. There are a surprising number of real cases where sleepwalking has been used as a successful defense in murder cases. The most remarkable might be a Canadian man named Kenneth Parks who, in 1987, with no known history of violence, got in his car, drove fifteen miles, climbed in the window of his in-law's house and attacked them both with a lead pipe, ultimately killing the mother-in-law he'd by all reports always been very fond of. He argued that he was sleepwalking the entire time and had no memory of the events. Because he had a well-documented history and genetic predisposition to the condition, he was eventually acquitted. Neighborhood Watch includes fairly complex themes such as somnambulism and physics; are these ideas that you were already familiar with before writing the novel? I knew a little about somnambulism (a dear friend from college married a man who used to get up and eat large quantities of strange, uncooked things out of the refrigerator at night--a package of hot dogs, or a stick of butter. This is more common than you'd think and as a result it is possible to install refrigerator locks as they did...) I knew very little about physics but my dear brother is a mathematician (and professor at the University of Washington!) who read many drafts of this book and gently steered me in certain directions. Bless his heart, he's also a mystery reader with a good sense for story and how much information one needs to impart without getting too bogged down in passing along all the fascinating research you've done. The novel takes place on a Desperate Housewives-esque suburban street, Juniper Lane. Though many typically think of suburbia as being dull or boring, Neighborhood Watch shows readers that it can be exactly the opposite. Can you tell us more about your choice for using Juniper Lane as the novel's setting? I've always been especially fascinated by the housing developments that pop up on old farmland with no trees or natural landscaping and look like an oval Monopoly houses. Part of me can see the great appeal of these developments, where everyone would be equal with identical houses. Your lives might be a shared refelction of each other's almost like the old level-playing field of a college dorm. But of course it isn't really a level playing field and every house on the street might look the same but they all contain secrets. My interest was in looking at how those secrets--many of which might seem perfectly benign--become dangerous and even explosive when the neighbors begin turning a steely on one another with the formation of their new Neighborhood Watch group.